There’s a slight breeze but the air is hazy with humidity on this August day in Metcalf, Illinois. A dull cicada chorus surges to drown out other noises as we await Nickel Plate timetable train 49 to pass. A B&O switcher has paused to obey the signal in anticipation. The grain bins will be full soon as another local harvest approaches on the calendar. A distant whistle pierces the air as the westbound blows for a crossing east of town. It’s time to move down to the tracks with the new Leica and capture a Berk on the mainline. This is Metcalf on Tony Koester’s HO scale Nickel Plate Road, Third Subdivision layout. Metcalf is a town on the east side of the state just north of U.S. Route 36 where NKP’s St Louis line and B&O’s Indy/Decatur line cross. In the northwest corner of the crossing were located dozens of standard size “Butler” grain bins. Tony’s modeling the scene using several of our grain bins. As of now the bins aren’t painted. They’re in the natural grey casting color. We have plenty of these bins in stock on our Scenery Stuff page. New kit – Boiler load! Resin Car Works announces a new addition to the Scenery Stuff line! These simple resin kits can enhance a scene on your model railroad. 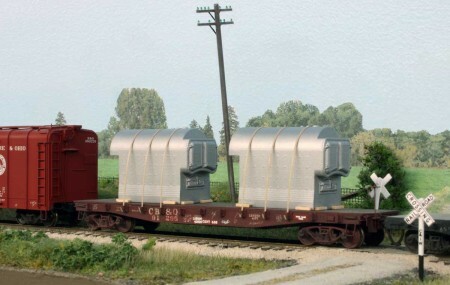 The latest kit represents a boiler load for open top freight cars.